Since the first list of biotech companies active in the microbiome space was published in 20131, the growth in microbiome-dedicated biotechs has been staggering, with almost several hundred companies either privately-held or publically-listed. Given the rapid growth of these organizations, it’s critical to understand how to effectively establish, grow and sustain microbiome-focused companies to develop novel therapeutics, biomarkers or diagnostics. Stimulated by the Polsky Center for Entrepreneurship & Innovation, ClostraBio has since raised $4.5 million to develop microbiome-based therapies that prevent or treat allergic reactions to foods and other immune system disease2. As a well revered researcher in the food allergy space, Prof. Nagler will share her thoughts on committing to academia whilst growing a young biotech. With a background in computational biology and computer science, Mollie played a key role in establishing the first computational platform for drug discovery at Kaleido Biosciences, a Flagship microbiome company3. Now as a senior associate, Mollie is working as part of a team of entrepreneurial scientists to conceive, create, resource and develop the first-in-category ventures. As part of her role at Pfizer, Arpita seeks to identify late-breaking science that forms the basis of innovative therapies and drives related collaborations alongside scientists and start-ups. Having recently contributed to a publication in Nature Biotechnology4, Arpita is an experienced microbiome researcher and will share new insights into pharmaceutical opinions on microbiome start-ups. Having helped establish four microbiome-focused biotechs as part of the Polsky Center for Entrepreneurship & Innovation5, Matt works alongside academic researchers and provides access to commercialise their resource including intellectual property development, venture creation, team building and fund raising. With over 11 years of experience in small molecule drug discovery across various therapeutic areas, Suguna is currently working alongside Dr. Stanley Hazen at the Cleveland Clinic to help commercialise novel research looking at developing a microbiome-based therapeutic to inhibit thrombosis potential6 . 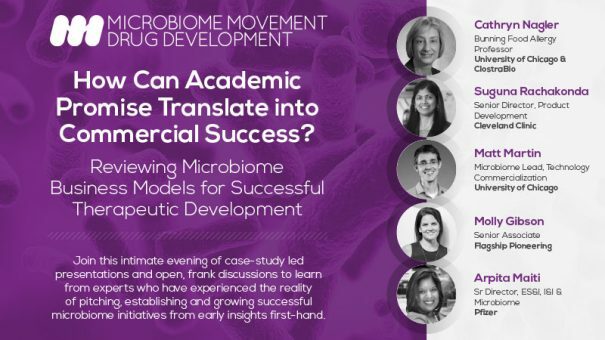 Join the Microbiome Movement as we unlock the therapeutic potential of the microbiome, network with a growing community of cutting-edge researchers from industry and academia, and push your own projects to the next level. Click here to see the full 3 day agenda.